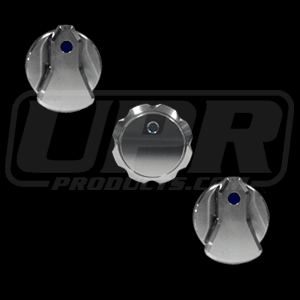 Ditch the stock plastic OEM AC control knobs from your 89-04 Ford Mustang for a set of precision CNC Machined Designer & Climate AC Control Knobs from UPR. Adding that extra level of personalization to your Mustang to separate you from the rest and giving your interior a cleaner look. Crafted to fit and function as good as the OEM knobs, while giving you the bold clean styling of the Best looking aftermarket Dress Ups for your American Muscle Car. Precision Machined 6061 Billet Aluminum. 1989* 1990 1991 1992 1993 1994 1995 1996 1997 1998 1999 2000 2001 2002 2003 2004 Ford Mustang LX GT GTS Cobra Shelby Roush Saleen & Vehicles. 1999 2000 2001 2002 2003 2004 Ford Superduty F-250 F-350 F250 F350 Excursion Truck SUV 1994 1995 1996 1997 1998 1999 2000 2001 2002 2003 Ford Ranger Truck Explorer SUV * Verify the size of your AC knob. This year came with both the larger 87-88 (1 9/16) style and smaller 90-04 (1 3/16) style. No one else can stack up to the bold clean styling of our aftermarket Billet dress ups, Street Strip & Racing Suspension & Performance Parts for your late model American Muscle Car!